This practical event for farmers, land agents and landlords focused on the theme of agroforestry implementation, in particular the barriers relating to land tenure. Dartington Estate is delivering agroforestry in an innovative way not seen in the UK before, through a multi-tiered arrangement of land owner, farm tenant and agroforestry tree license holders. What makes this unusual – and exciting – is that by enabling several different businesses to work together to farm the field, they have created an approach to agroforestry that overcomes some of the barriers which have prevented a wider uptake of agroforestry in the UK. 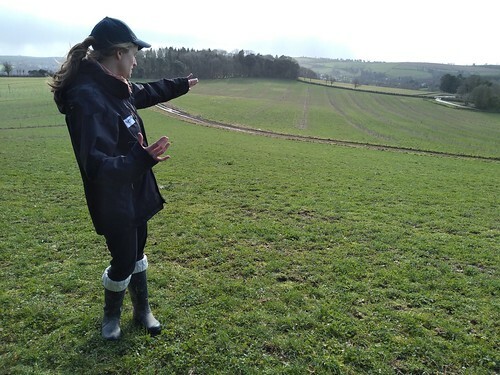 You can read more about the agroforestry and Dartington’s journey to get the system established in Harriet Bell’s excellent blogs. The day started with an introduction to Dartington Estate from the estate manager John Channon, before splitting into two groups and heading out on a tour of the different agroforestry enterprises on the estate and an opportunity to gain a farmer’s perspective on agroforestry as a tenant farmer from Jon Perkin, Marina O’Connell and Jane Gleeson. Half the group went on a tractor/ trailer to visit the furthest away fields, Huxhams Cross, where vegetables are intercropped with short rotation coppice and apple tree agroforestry rows, while the other half walked up to the main agroforestry field at Old Parsonage Farm where the tree rows are managed by different tree licensees growing elder flowers, Szechuan peppers and apple trees intercropped with arable cropping. The groups met and swapped over at Schumacher fields, an apple tree/ vegetable agroforestry system with a nut and fruit tree nursery, a forest garden and a productive hazel windbreak. We stopped en-route to discuss the Estate’s plans for a new silvopastoral system with medicinal plants for livestock to browse. After lunch a panel discussion explored the subject of agroforestry as a tenant farmer and as a landlord/ land agent. The issue of farm tenancy is one of the barriers to uptake identified in previous AFINET workshops and an important subject to address, as short-term farm tenancies do not encourage the establishment of longer term crops such as trees and landlords can be unwilling to allow tenants to plant trees. The panel was chaired by Ben Raskin from the Soil Association and Eastbrook Agroforestry and included long term Dartington tenant Martin Crawford, Caroline Foot from the Tenant Farmers Association, Richard Jackson the Estate Manager at the National Trust site Killerton, who has ambitious designs for implementing agroforestry on the tenanted farms across the estate, Stephen Briggs, a tenant farmer from Whitehall Farm and director of Abacus Agriculture and Jeremy Smith from Savills who helped to put together the Dartington Agroforestry tenancy agreement. The overwhelming conclusion from the discussions was that in order for agroforestry schemes to be successful on tenanted land it needs to be a partnership between the landlord and the tenant with good communication with all parties right from the start and the lines of communication need to be kept open. Most obstacles can be overcome with the right agreement in place. This panel discussion led onto a short presentation and open discussion on the current status of agroforestry policy in the UK and opportunities to influence the decisions that will be made around policy in the coming months – with an appeal to all RAIN (Regional Agroforestry Innovation Networks) members to contact their local politicians to keep up the profile of agroforestry as changes are made. Outputs from AFINET, the Knowledge Cloud and the new improved Farm Woodland Forum website www.agroforestry.ac.uk (new website coming soon at this address) were then presented, along with an overview of agroforestry-related EIP Operational Groups in the UK and Innovative Farmers activities. The main operational group of relevance is WOOdchip for Fertile Soils (WOOFS); this group looks at the integration of on-farm woody elements into cropping systems as a soil improver. The take home message from a fascinating day was that in order to implement a successful agroforestry system on tenanted land a partnership approach with the landlord, land agent and tenant all cooperating and communicating is crucial.